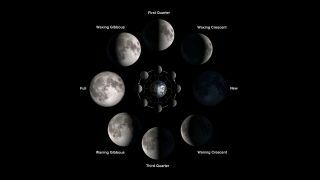 This graphic shows the phases of the moon and the orientation of the moon, Earth and sun during each phase. International Observe the Moon Night (InOMN) is this Saturday (Oct. 8), but the best way to get to know Earth's neighbor is by observing it over multiple nights (and days). InOMN is an annual celebration of the moon that was started by members of NASA's Lunar Reconnaissance Orbiter (LRO) team. The event organizers urge people to get out and observe the moon or even to host observing parties. But seeing the moon on just one night is kind of like seeing the trailer for a new movie — it's just a sample of something much bigger. If you can observe the moon for only a single night, check back every 20 minutes or so, and look for the movement of the "terminator line" across the surface of the moon. (This is the line that divides the illuminated portion of the moon's surface from the shadowed portion.) In fact, observing the moon while it has a terminator line can be better than observing a full moon, even though the latter often draws out casual skywatchers. Jones said it's often easier to see features on the surface of the moon right at the terminator line, because the contrast of light and dark makes those features stand out. So, as the line moves across the surface in a single night, it's possible for skywatchers to see different features or different portions of a single feature. With a pair of binoculars or a small telescope, many spectacular features can be spotted on the moon. See how to observe the moon in this SPACE.com infographic. "It's fun to be able to do that kind of observing and notice the patterns in the sky," Jones told Space.com. "We have so many snapshots in our lives … to actually make an investment and really allow that time with our moon [is valuable]." It's not just youngsters who can benefit from studying the moon's daily changes. Jones said the InOMN group conducts workshops for teachers who give lessons about the moon and its phases, and prior to the workshop, the teachers are asked to complete a lunar journal for a few days or weeks. Jones said the teachers are often surprised when they observe the lunar activity themselves. "Some of them have been teaching about moon phases for decades, and I'll get emails before the workshop saying, 'I can't find the moon!'" Jones said. "And I say, 'OK, how about check at a different time of day?' And then, they'll be like, 'Oh my gosh! I had no idea. It's 8 a.m., and I can see the moon!'" Of course, photographs of the moon can also help people learn about Earth's companion. Images of the lunar surface captured by powerful telescopes or probes can reveal incredible details that are not visible to the naked eye or even through small telescopes; there's also all of the amazing science those instruments can reveal. There are some resources that can help you get to know the moon a bit better. The InOMN website has various moon-observing resources and more information about the celebratory night. The website Timeanddate.com will show you the time of moonrise and moonset in your area, as well as the current phase of the moon. If you're thinking about buying a small telescope or pair of binoculars, check out some of our Space.com buyer's guides. See our calendar of 2016 celestial events to watch out for, our full-moon calendar, our satellite tracker, our guide to measuring distances on the sky and our monthly skywatching column.